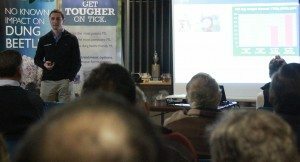 Virbac Senior Product Manager – Livestock, Tim Porter, discusses the importance of strategic and coordinated tick management programs at a producer meeting organised by the Brisbane Valley Vet Clinic in Crows Nest last night. A new animal health campaign is encouraging cattle producers in tick-affected areas of Queensland, northern NSW, the Northern Territory and Western Australia to take a proactive instead of reactive approach to managing the costly parasite. A Meat & Livestock Australia study recently identified cattle ticks as the single most costly animal health issue affecting Australia’s cattle industry. The report, the first comprehensive analysis of disease impacts affecting Australia’s cattle herd for more than a decade, found that ticks cost the industry an estimated $161 million in treatment and lost productivity costs per year. Most of that cost is shouldered by producers in tick-zones of eastern and northern Queensland and large parts of the Northern Territory and Western Australia. The animal health company Virbac has developed a new approach to managing cattle tick, which it officially launched at a producer function with the Brisbane Valley Vet Clinic in Crows Nest last night. The new approach has been developed in consultation with university academics, private veterinarians and the Queensland Department of Agriculture. Virbac cattle veterinarian and former district veterinarian Dr Matt Ball said there has been a dramatic change in thinking as to what constitutes best practice in tick control. In the past tick control has typically focused on reactive treatments designed to kill ticks when infestations become an issue. This has resulted in more costly chemical treatments, increased risk of parasite resistance to active chemical ingredients and an ongoing failure to prevent reinfestation when the risk from pasture is not managed. Producers are being urged to use strategically timed treatment combinations to maximise tick control on the animal and to help to manage and prevent re-infestation of larvae on pasture. “This is probably the biggest change to the practice of tick management in cattle,” Dr Ball said. “Commonly there is a large focus on managing tick on the animal with repeat use of relatively low potency short acting chemicals. “There is often little focus on considering the impact of tick in the environment or choosing the most potent combinations of products. The main message to producers is that a strategic, coordinated plan will significantly cut treatment costs over time, while improving control effectiveness, delivering better cattle weight gains and productivity, and reducing the risk of parasite resistance to available treatments. Dr Ball stressed that it was very important for producers to start their tick program early to prevent a built up of ticks in the paddock. This largely explains why Virbac is launching its spring tick campaign now in mid-July. Many producers might not be aware that seeing 30 obvious fully engorged adult ticks actually means there will be about 9000 ticks on the animal. “Starting a program early in the ‘spring rise’ when you first start seeing ticks will prevent future generations of ticks contaminating your paddocks for the rest of the season,” Dr Ball said. Dr Ball said cattle ticks in Queensland have developed resistance to a number of common chemicals. “Programs using a strategically timed combination of the Cydectin range and Taktic will delay the onset of tick resistance and provide a new powerful tool for many Queensland producers.” More information about these programs can be found by contacting Virbac. The cattle tick (Boophilus microplus) is a single-host tick, which means all three stages of development (larva, nymph and adult) occur on the one animal. This gives a better chance to control the parasite compared to three host ticks such as the paralysis tick. Short term use of high stocking rates with persistent products is very effective. It only takes 18 to 40 days for an attaching larva to become a fully engorged female ready to drop off the animal and lay over 3000 eggs. However eggs and larva may remain in the pasture for over ten months. Cattle ticks thrive in warm, humid conditions, so tick activity and survival varies on a seasonal basis. Correct timing of treatments will have the greatest impact on tick numbers. An effective program requires an integrated program that will give maximum control with the least number of treatments.